Hawaii is a great place to watch shooting stars during the annual Perseid meteor showers. Don't miss the best predictable meteor shower of the year. This year the best viewing is Aug 11-13th, with the peak in the early morning of Aug 12th. Look up to see shooting stars across the entire sky. Best viewing is done away from city lights. Look up to the skies and you can expect shooting stars. as many as over a hundred an hour during peak viewing. Don't miss the the brightest planets, Venus, moon and Jupiter will also be visible in the predawn hours. Look for the triple alignment in the eastern sky before sunrise on the three mornings of highest meteor activity. Perseids can be seen any time after 10 to 11 pm. The best time to look, however, is during the dark hours immediately before dawn. This year’s display is extra-special because of the planets. Jupiter, Venus, and the crescent Moon are gathering together just as the Perseid meteor shower reaches its peak. The alignment occurs in the eastern sky before sunrise on the three mornings of highest meteor activity. According to NASA "On August 11th, a 33% crescent Moon will glide by Jupiter, temporarily forming a bright pair directly above brilliant Venus. Red-giant star Aldebaran will be there, too, adding a splash of color to the gathering: sky map. On August 12th, the narrowing 24% crescent Moon will drop down between Jupiter and Venus. Together they make a bright 3-point line in the sky, frequently bisected by shooting stars: sky map. On August 13th, with the shower just beginning to wane, the planets put on their best show yet: The 17% crescent moon will pass less than 3 degrees from Venus as Jupiter hovers overhead. Sky watchers say there’s nothing prettier than a close encounter between the slender crescent Moon and Venus–nothing, that is, except for the crescent Moon, Venus and a flurry of Perseids: sky map." You can also use the meteor counter this year to tally the falling stars. It's actually the Perseid debris stream, the meteors are seen lighting up the atmosphere as the earth passes through the debris stream of the Comet Swift-Tuttle. The comet was most likely observed by the Chinese in 69 BC and AD 188. Swift-Tuttle is a periodic comet with an orbital period of 133 years. It fits the classical definition of a Halley-type comet with a period between 20 and 200 years. It turns out counting those shooting stars are valuable. NASA wants them. Meteor tallies gathered by amateur sky watchers can be used by NASA’s Meteoroid Environment Office to study and model the Perseid debris stream. “We’ve developed an app for Android and iPhones to help amateur sky watchers count meteors in a scientific way and report the results to us,” says Bill Cooke of NASA’s Meteoroid Environment Office. 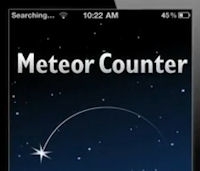 The ‘Meteor Counter is available for free in the Android Marketplace and Apple’s App Store. For more news about the night sky and citizen science, please visit science.nasa.gov.